The election of a fascist signals the beginning of a new era. Today is an historic event for Brazil and Latin America, as the far-right presidential candidate Bolsonaro looks to be elected with 55% of the vote. Bolsonaro is the latest figure in a series of far right governments across the world, from Donald Trump in USA, to Rodrigo Duterte in the Phillipines and the xenophobic coalition of Salvini and Di Maio in Italy. As did most of these presidents when they were candidates, they presented themselves as being anti-establishment and outsiders. Except for Donald Trump maybe, the rest were living off politics for quite a while. The same goes to Bolsonaro, who has been a congressman for 25 years, during which he merely drafted two bills and one amendment. 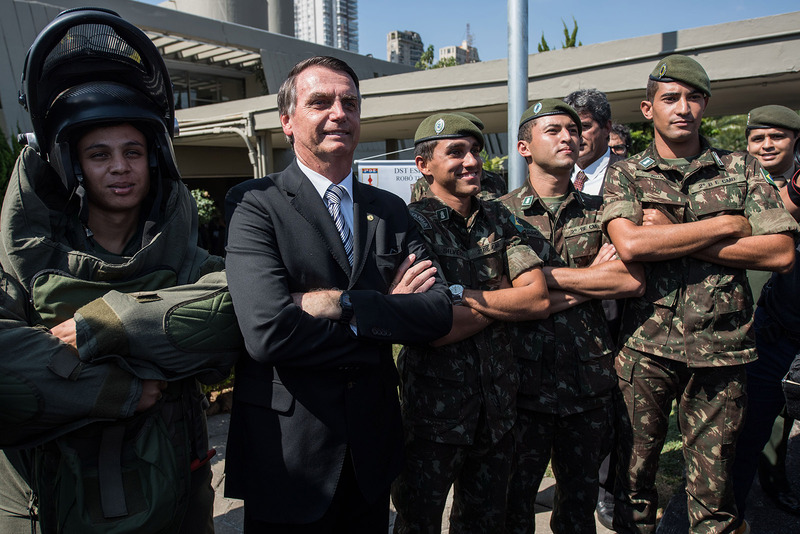 A former army captain, Bolsonaro had been known for quite a while for his appearances in television, where he praised the use of torture, the beatings of LGBT people, and the “cleansing” of his country from the leftist disease. It was with these public statements that he got 49 million votes in the first round of voting, obtaining 46%. There has been a turn to the right recently in Latin America. The elections of Mauricio Macri in Argentina, Sebastian Piñeira in Chile, Pedro Pablo Kuczynski in Peru and Ivan Duque in Colombia signaled the end of the decade of left-wing governments, that saw 70 million people getting out from poverty, almost 30 million of which were in Brazil, because of Keynesian measures of economic growth and redistribution of wealth, fueled by the rising prices of commodities. We talked to Rodrigo Costa, a Brazilian historian, that when asked what about the poor people that thanks to the measures taken by the PT could overcome poverty, join the middle class, and now vote against Haddad. And what about the poor people that thanks to the economic measures taken by the PT became middle class and now votes against Haddad? He answered that, “that's the contradiction. Any increase in money during that period went to people's heads and made them think they belonged to a higher class”. To understand the reason why a character like Bolsonaro can have such fighting chances, one must look at the regions scandals of corruption and at the economic recession (the worst in its history) that the country faced during the 2014-2016 period when the GDP per capita shrank by 10%, and has not yet fully recovered. The main reason for his sure victory, was the imprisonment of Lula da Silva, the former president of Brazil from 2003 to 2011. He was going to run for office again, and all the polls predicted his victory, but earlier this year, he was tried and imprisoned unfairly, in order to prevent him from running, making him a political prisoner according to the UN committee on human rights. This is a turning point for the region. The biggest and richest country in Latin America, which was once deemed as an economic super-power and formed along with China, South-Africa, Russia and India the BRICS, is facing the rise to power of a fascist. It is unclear what economic measures he will implement, but we can expect a series of privatisations, a reduction of public spending, income tax cuts, payroll tax breaks for companies and a pension reform. His economic guru, Paulo Guedes, a free market enthusiast and PHD trained economist at the University of Chicago, is a neoliberal in favour of massive spending cuts, aiming at reaching a zero budget deficit in the first year of government. With regards to security, his stance on gun control is appalling. Promising to make easier for everyone to own a gun is his answer to the recent epidemic of violence that has spread all over the country, resulting in a record of 63,880 people murdered in 2017. He is in favor of the deployment of the army in the favelas, of relaxing self-defense legislation and to give police more discretion in the use of deadly force. Today the whole region faces a major shift in political history, and its possible ramifications remain unknown, but they sure are not promising.